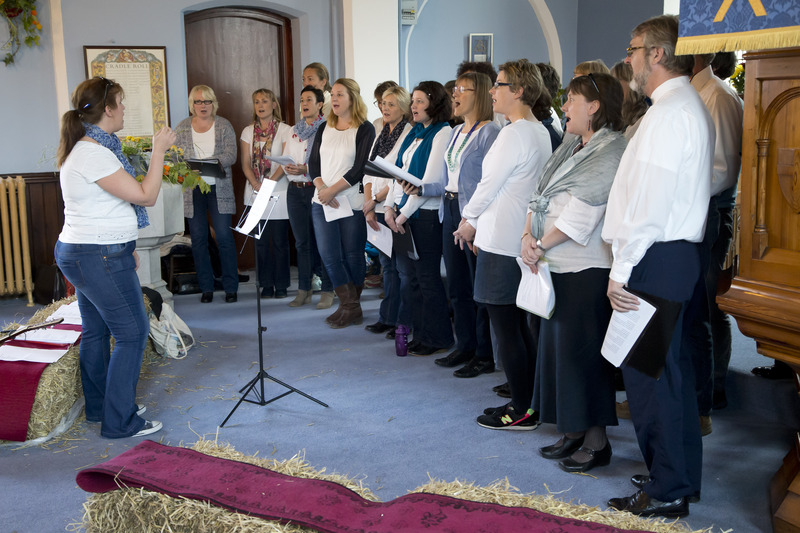 ALIVE and KIRKing is our on-going outreach campaign which was launched on 17 October 2015 with a Free Music Festival and Ceilidh followed by our Harvest Festival Family Service on Sunday 18 October. The next ALIVE and KIRKing event is our St Andrew’s-tide service and lunch which is on Sunday 29 November at 1045. Thanks to Thumb Design for making us so visible. In fact you could hardly miss us! St Andrew’s was truly ALIVE and KIRKing on 17 and 18 October. Handbells, happy children, Craig Durning, Bayvox Choir and a fabulous ceilidh to round off Saturday evening, ALIVE and KIRKing Festival was described as possibly the best social event we’ve ever had. And to cap it all, on Sunday our pews were full for our ALIVE and KIRKing Family Harvest Festival where thoughtful words and engaging activities helped children `of all ages` understand the Harvest message. 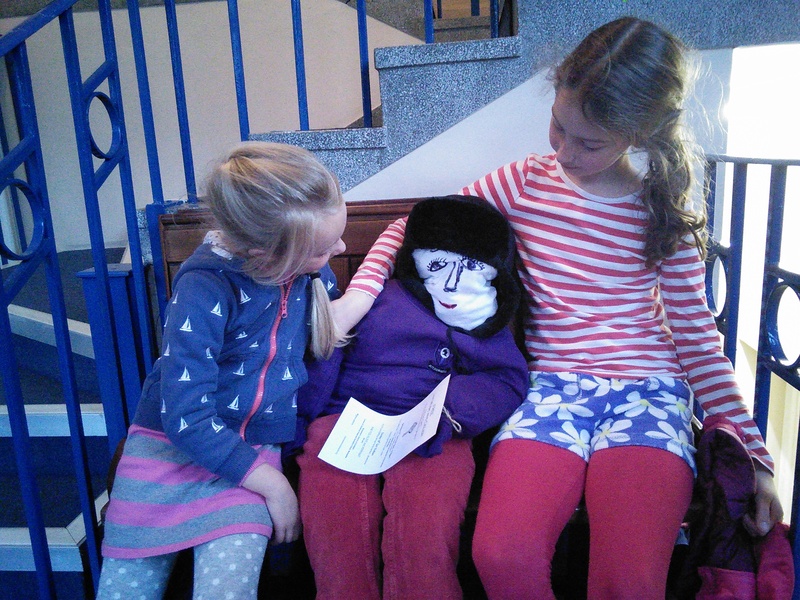 Here they are with their entry who `surprised` a number of us sitting just inside the vestibule. We hope they enjoy spending their vouchers in Eldon Square! 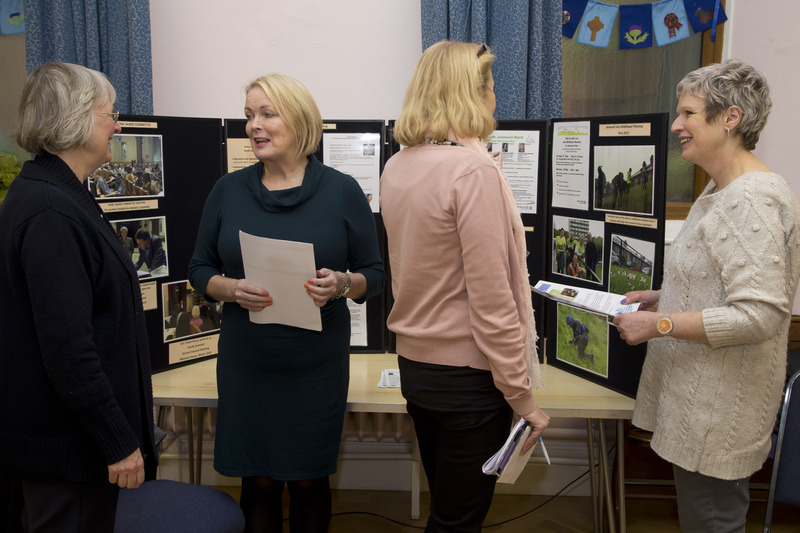 We were delighted that Newcastle City Council supported our event as part of their local consultation exercise. St Andrew’s Kirk has been part of this locality for 110 years and wants to remain a focal point for the community. Councillors Ainsley and Mendelson spent time talking residents. 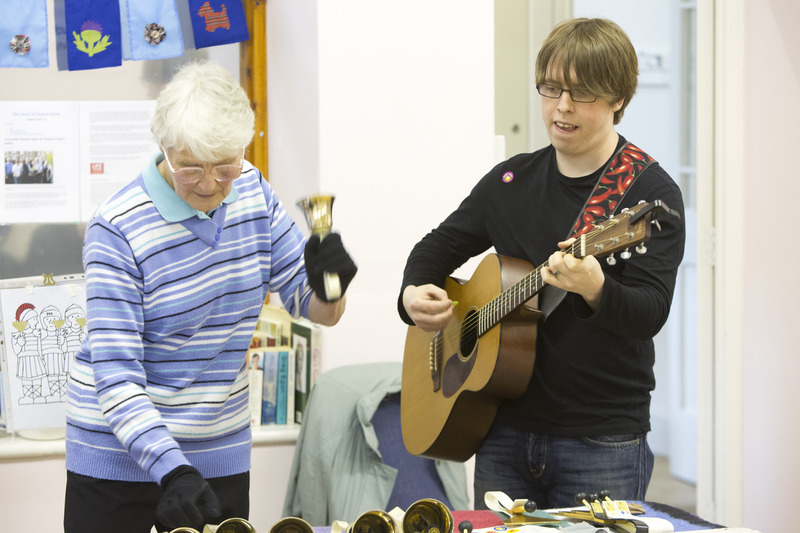 Our range of music seemed to strike the right note with the Heddon on the Wall Handbell Ringers a great hit with visitors of all ages who wanted to have a go. Bayvox Community Choir from Whitley Bay kept the audience spellbound with the Kirk acoustics adding to the atmosphere of their a cappella singing. Glasgow singer songwriter, Craig Durning’s music, memories and anecdotes were another highlight of the day, while his children’s worship session kept the young audience enthralled. 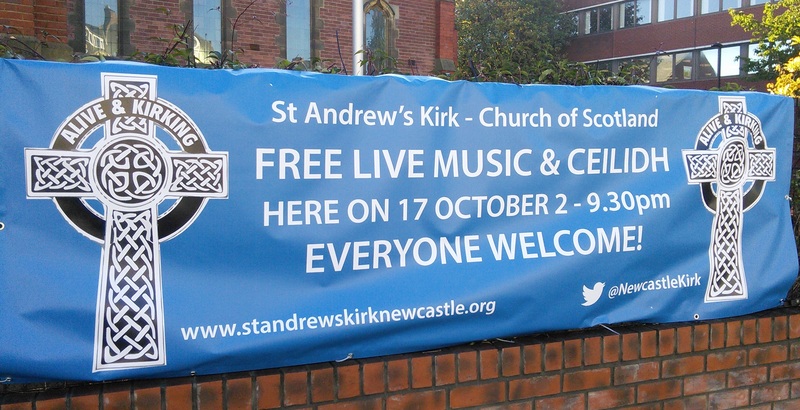 On Saturday 17 October St Andrew’s Kirk in Newcastle will be `ALIVE and KIRKing` from 2pm – 9.30pm with live music, fellowship, café and a ceilidh to round it all off. An important part of the event however will also be a sanctuary area set aside for prayer and reflection. Throughout the day there will also be crafts to try and buy, a presentation about the history of the Kirk will be showing and Newcastle City Council will be there as part of their local consultation. And to feed the hungry the Celtic Café will be selling snacks. The sanctuary will available for contemplation until 6pm. The area’s only Church of Scotland, St Andrew’s Kirk in Newcastle, will prove that, after almost 500 years of Scottish Presbyterian worship in the city, it is still `ALIVE and KIRKing` when it holds its first ever free music festival and ceilidh on Saturday 17 October from 2pm. Highlights include the internationally renowned Celtic, Christian singer Vivienne Neville, Bayvox Community Choir from Whitley Bay, Glasgow singer songwriter Craig Durning and a special session for children from Bookhappy. The day will start with the harmonious Heddon-on-the-Wall Handbell Ringers and the evening will be rounded off by the fabulous Newcastle Ceilidh Band. Vivienne, who tours regularly in the USA, has been compared vocally to Enya and Moya Brennan, while Bayvox offers a rousing choral contrast. 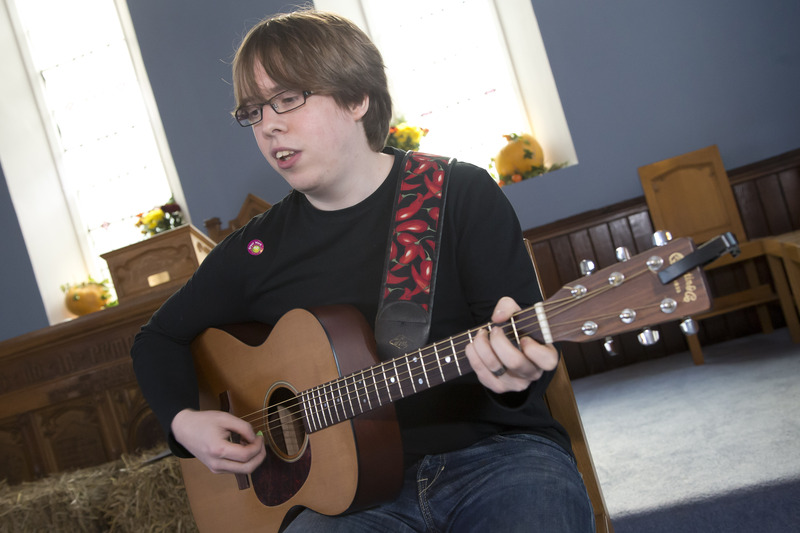 Craig will be performing a couple of sets as well as leading the children’s programme with junior worship. This will be followed by a lively session from Bookhappy full of songs, rhymes and games based on best-selling children’s picture books. 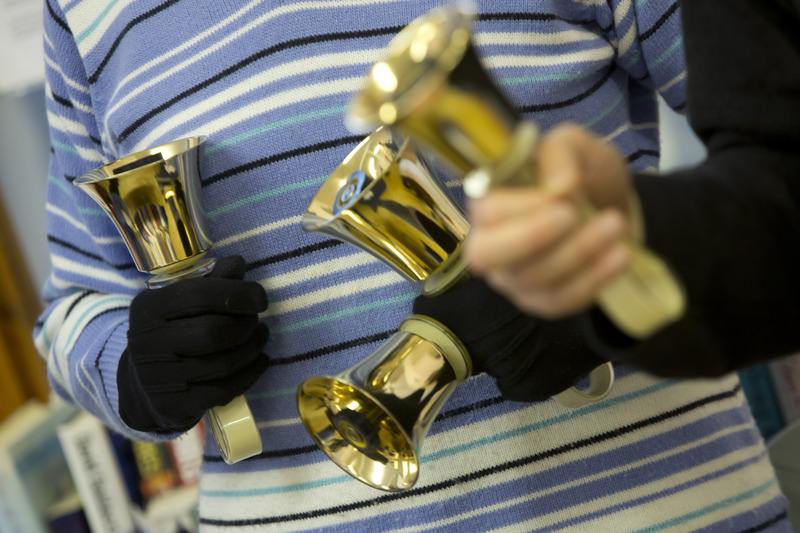 And if you want to try something different then there will be an opportunity to `Have-a-go at Handbells`, or make a Sacrecrow to bring along for our Harvest Competition. The day will conclude with a free evening ceilidh starting at 7.30pm – tickets can be reserved at the Church on the day. And to keep the energy levels high, the Celtic Café will be selling snacks with a flavour of Scotland. As well as music, crafts and activities, Newcastle City Council will also be at `ALIVE and KIRKing` until 5pm to give Sandyford residents the opportunity to talk about improvements to the area. Are you ALIVE and KIRKing?